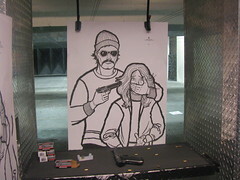 I opted to shoot the hostage, of course. This was scary but fun. Our teacher told us every one of his students hit the bull's eye on their first or second practice shot and, true to form, we all did. The craziest thing: The way the gun recoils always had me freaking out about not shooting straight and missing the target (you can only miss the sheet once - twice and you're asked to leave) but I never missed. Weird.